Authored by St. Thomas Aquinas, Authored by Fr. Henry Rawes D.D. Saint Thomas Aquinas OP (1225 – 7 March 1274) was an Italian Dominican friar, Catholic priest, and Doctor of the Church. He was a philosopher, theologian, and jurist in the tradition of scholasticism and is also known as the Doctor Angelicus and the Doctor Communis. 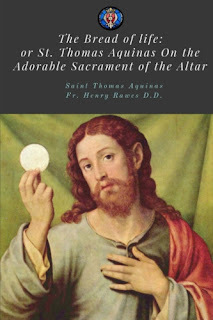 "There is a very beautiful treatise of St. Thomas Aquinas on the adorable Sacrament of the Altar. It is hard to know which to admire more, the fulness and precision of its arrangement, or the way in which he brings in the words of the Holy Ghost from the Sacred Scriptures. From this treatise, and nearly always in its very words, I have arranged these Meditations for the Servants of the Holy Ghost. In fact, all that was needed was to number or letter the divisions of the book so that they could be easily seen. The prayers and thanksgivings I have added. I have put the teaching of the Saint by itself, and the words of the Holy Ghost by themselves. In this I have only carried out what St. Thomas has himself done in the treatise. For the more part he has, after stating and explaining his points, put the texts by themselves, referring to the first point, the second point, the third point, and so on. Putting them all together, therefore, is only carrying out what this Angelic Saint has done." - Preface. p. 2. © Go to Mary. Powered by Blogger.